Monitoring of temperature and humidity in different zones of the office building. Processing of collected telemetry with various alerting rules based on zone type: work space, meeting and server rooms. Distribution of collected alarms to assigned facility managers. Visualization of real-time and historical values on the configurable web dashboards. This article describes development and configuration steps we have done in order to build the PoC. The prototype is open-source and is also based on open-source technologies, so you are able to use it for building commercial products. We decided to use quite cheap hardware based on ESP8266 and DHT22 sensor. The total cost of each device that includes sensor and connectivity module is approximately 5$. Since this is a prototype, we decided to use MQTT over WiFi and have not discussed other connectivity options. The server-side part of the solution will be based on the Thingsboard IoT platform which is 100% open-source and can be deployed both in the cloud, on premises or even on Raspberry Pi 3. The collected data is stored to Cassandra database due to built-in fault-tolerance and scalability. We have recently launched Live Demo instance to simplify getting-started process, so we will use this instance in the tutorial. Initial step of the PoC was to provision several devices and their attributes. 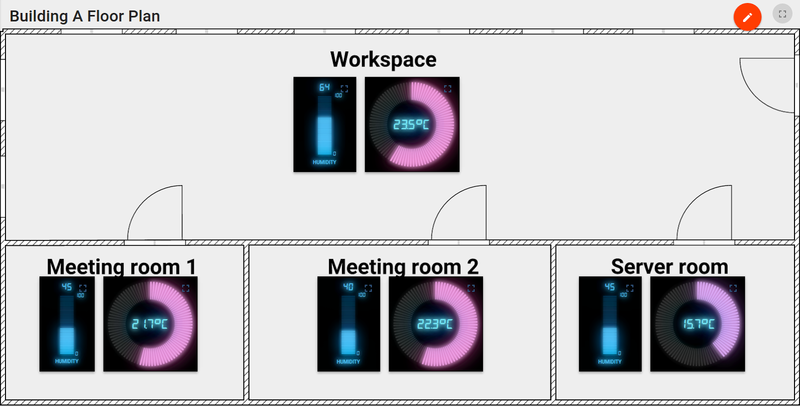 We’ve decided to support three zone types: work area, meeting and server rooms. We have registered three buildings with four rooms in each. During registration we have populated Zone Id, Zone Type server-side attributes. Note that the server-side device attributes may be used by the processing rules, but are not visible to the device itself. During this step we have flushed firmware update with individual device credentials built-in to the firmware. The firmware code and corresponding instructions are available in links below. We have used code from our previous article without modifications, since all the logic is on the server side. Please note that steps 1 and 2 may be automated, we’ve developed simple java based application that performs provisioning of the devices and other entities using REST API and also emulates this devices for the live demo purposes. During this steps we have provisioned rules that analyze temperature and humidity against configurable thresholds based on zone type. For example, acceptable humidity range in server room is between 40% and 60%, however, humidity range for the work zone is from 30% to 70%. You may notice “null” checks in the filter body. This is basically a good practise, because you may use same server for multiple device applications. Some of them report humidity and temperature, some of them upload other sensor readings and this should not affect rules processing. [$date.get('yyyy-MM-dd HH:mm:ss')] $ss.get('ZoneId') HVAC malfunction detected. [2016-12-22 15:06:09] Server Room C HVAC malfunction detected. The evaluation and template syntax is based on Velocity engine. At this step we provisioned several dashboards to visualize the data. We will describe them below. This dashboard shows multiple buildings on the map with their short status available in the tooltip. You can use links in the tooltips to navigate to Floor Plan and Historical Data dashboards. This dashboard uses static background image with the floor plan. We have placed widgets that show temperature and humidity in each room that is being monitored. This dashboard shows last minute of sensor readings that are reported each second. Sign-up or login to the live demo instance and save your login and password. Download and launch device emulator using this link. 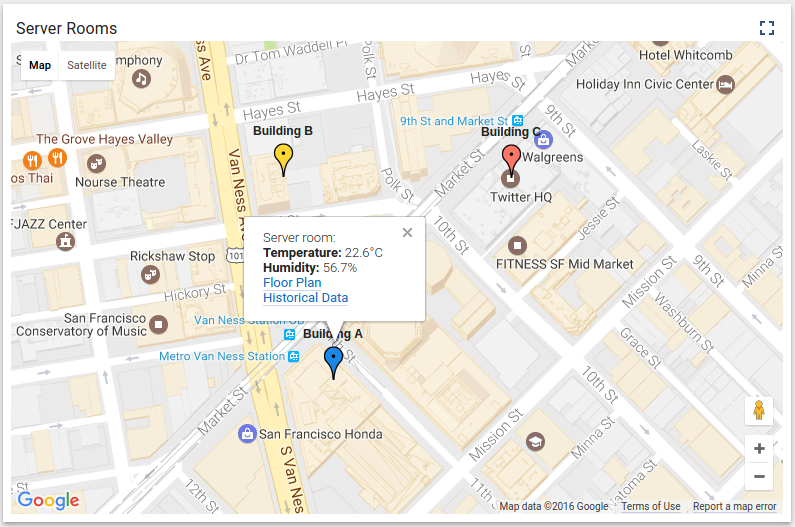 start emulation of the temperature and humidity sensor data for provisioned devices using MQTT. This prototype was written by two engineers literally in one day. Most of the time was spent on the client-side code (Arduino sketch for real device and emulator). The server-side part of the prototype has zero coding and was all about configuration of the rules, plugins and dashboards. This demonstrates how easy is to prototype and build IoT solutions using Thingsboard. Of course, there is certain learning curve that you need to pass, but we hope that this article and other docs will help you to do this.